Georges "Rush" St-Pierre, or GSP as he is commonly known, is the current UFC Welterweight Champion. He has won his last 10 fights with an 11th soon possible at UFC 154 and has gone unbeaten for the past four years. Canadian by birth, Georges was named the Canadian Athlete of the Year in 2008 and 2009 and in 2009 he was voted the Most Outstanding Fighter by the Wrestling Observer Newsletter. He won the World MMA Award title of Fighter of the Year in 2009. Georges St Pierre UFC Welterweight Champ is ranked by many publications as the top pound for pound fighter as well. Born on May 19, 1981, in Saint Isidore, Quebec, St-Pierre took up Kyokushinkai Karate at seven years of age to wart off bullies at school who were stealing his clothes and money. When his Karate instructor passed away, he began learning wrestling and Brazilian Jiu-Jitsu. He also trained in boxing. Before he fought MMA professionally, Georges worked as a bouncer at a night club in Montreal and also worked as a garbageman. While watching Royce Gracie in UFC 1 in 1993, Georges St Pierre knew he wanted to become a UFC Champion. By age 16 he had fought his first amateur match against a 25 year old boxer. He won the fight by knockout. On January 25, 2002, St-Pierre made his professional debut against Canadian Ivan Menijvar. The fight was at the event UCC (Univeral Combat Challenge)7-Bad Boyz and Georges St-Pierre won by TKO only four minutes and fifty-nine seconds into the first round. His second professional fight was for the UCC title belt and was on June 15, 2002 at UCC 10. Georges St-Pierre went up against Justin "Loaf" Bruckmann and defeated him via arm bar in round one. The UCC Welterweight title was his. When the UCC converted to TKO Major League MMA, Georges was declared the TKO Champ. Georges St-Pierre next two fights were to defend his title. 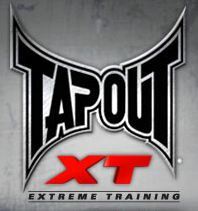 The first match was against Travis Galbraith on October 11, 2002 at UCC 11: The Next Level. Georges St-Pierre won in the first round TKO by elbows. On January 25, 2003, Georges St-Pierre took on Thomas Denny at UCC 12: Adrenaline. Four minutes and forty-five seconds into round two, St-Pierre won TKO (cut). 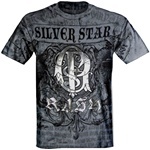 Rush was really beginning to make a name for himself in the MMA world. His style was unique and effective and his reputation as a "good ole boy" was catching on. Georges St-Pierre faced off with Pete Spratt an American MMA fighter from Denison, Texas at TKO 14: Road Warriors on November 29, 2003 in Canada. It was a much anticipated event and George St Pierre did not disappoint. He won the bout by Submission via Rear Naked Choke Hold in the first round. Georges St-Pierre made his debut in the UFC at UFC 46 which was held on January 31, 2004 in Las Vegas, Nevada. He went into the octagon against Armenian American Judo-style fighter Karo Parisyan and five minutes into the third round, won by unanimous decision. His dream to fight in the UFC finally became a reality and he was holding his own. The next fight on the list for St-Pierre was against Jay Hieron in June of 2004 at UFC 48: Payback, again in Las Vegas. Again Georges showed his stuff and won by TKO in the first round. His third opponent in the UFC was the notorious wrestling rooted fighter, Matt Hughes at UFC 50: The War of '04 for the vacant Welterweight Championship. The match turned out to be his first lost ever when he was forced into submission by arm bar in round one. George St Pierre refused to give up. He came back to win over Dave Strasser at TKO 19: Rage in January 2005, winning via kimura submission in round one. Next, Georges met up with Jason Mayhem Miller in the ring at UFC 52: Couture vs. Liddell 2 in Las Vegas, Nevada. It was a bloody duel but St-Pierre reigned victorious in the fifth round by unanimous decision. In both UFC 54 and UFC 56 proved what he was made of winning against pro- wrestler Frank Trigg via Rear Naked Choke and against Sean Sherk by TKO. Once again, Georges St-Pierre was on a winning roll. UFC 58 was the setting for his face off with the UFC Welterweight Champion, B.J. Penn. Georges St-Pierre won and earned the right to fight Matt Hughes at UFC 63 for the title. Due to a groin injury, St-Pierre had to pull out of the event and was replaced by Penn. It was announced, however, that St-Pierre and Hughes would rematch as soon as Georges injury had healed. Although George St Pierre was not able to fight, he did attend UFC 63 to cheer on his fellow Canadian fighter, David Loiseau (aka The Crow). He also entered the ring after the Hughes/Penn bout and had words for Hughes which Hughes took offensively. The taunting continued off-camera as well, setting the scene for a much anticipated rematch against the two. In November of 2006, Georges St-Pierre appeared as a trainer on the hit television reality show, The Ultimate Fighter 4: The Comeback. On November 18, 2006, St-Pierre stepped into the ring with Hughes to back up his tough talk. In the first round, Georges grounded Hughes with a superman punch followed by a left hook. Hughes remained in the game though until taken out with a left kick to the head and flurries of punches and strikes. Georges St Pierre won by TKO. He was declared the new UFC Welterweight Champion and signed a 6 fight deal. The glory was short lived, however. On April 7, 2007 in Houston, Texas at UFC 69: Shootout, Georges took on Brazilian Jiu-Jitsu practicianer, Matt Serra. George St Pierre lost the bout in the first round by TKO due to strikes. After the fight, he said he was not able to focus due to his father being seriously ill. It was at this time he split from his manager and most of his associates. By August, a refocused St-Pierre surfaced for UFC 74 where he faced off with wrestling champion Josh Koscheck. Georges was on top of his game and out wrestled Koscheck and won by Decision five minutes into the third round. Winning the fight put Georges as the number-one contender to take on the winner of the Hughes/Serra match. Serra was not able to fight due to a back injury therefore Georges would fight Matt Hughes once again. The bout would be for the interim belt. The two met up at UFC 79 on December 29, 2007 at UFC 79 in Las Vegas, Nevada. St-Pierre showcased his wrestling skills and blocked Hughes' take down attempts. Georges attempted a kimura on Hughes arm then switched to a straight armbar forcing Hughes to submit in round two. Georges was the new UFC Interim Welterweight Champion. GSP was not content with the title. He stated that it actually meant nothing since Serra was the real Champion. On April 19, 2008 the two met in the octagon at UFC 83 held in Montreal, Quebec. It was the first UFC event held in Canada which inspired Georges to give the fight his all. Early on St-Pierre lit into Serra with knees and a hodge-podge of blows that led to the fight stoppage in the second round. Georges was declared the Undisputed Welterweight Champion of the UFC. In August, Georges defended his title at UFC 87 against the former Purdue wrestling captain, Jon Fitch who was riding on a 16 fight winning streak. Five minutes into the fifth round, Georges won by Decision. A rematch was set against Penn and St-Pierre for UFC 94. It was one of the most anticipated UFC events ever. Georges did not disappoint. With a superman punch, he bloodied Penn's nose and wore Penn out with take-downs and put on a Hawaiian ground-and-pound. By the end of round four, the fight was stopped by request of Penn's corner man. Penn went to the hospital following the fight. Georges next title defense was against John Fitch at UFC 87: Seek and Destroy on August 8, 2008. George St Pierre won the fight by Unanimous Decision in the fifth round. Another title defense was in order, this time against purple belt Brazilian Jiu-Jitsu and top contender, Thiago Alves at UFC 100 on July 11, 2009. Thiago gave Georges a run for his money while standing but St-Pierre took it to the ground and showed his wrestling skills, winning by Unanimous Decision five minutes into the fifth round. Georges did not come out unscathed though, pulling a groin muscle in the fourth round. On March 27, 2010, Georges took on English fighter, Dan Hardy at UFC 111. It was the first time an British MMA fighter fought for a title in the UFC. Though Georges dominated the fight, Hardy refused to tap out. At the end of the fifth round, Georges was declared the winner via Unanimous Decision and remained the UFC Welterweight Champion. Still holding the belt, Georges St-Pierre met up with Josh Koscheck for a rematch on December 11, 2011 at UFC 124. The match was much anticipated since the two had squared off At UFC 75 and St. Pierre had out-wrestled Koscheck Koscheck. This one would be the fight to remember, however. Instead of being a wrestling match, the fighting was strikes and jabs, 55 jabs to be exact with St-Pierre being the executioner. Joe Rogan was quoted as saying it was "the most jabs I've ever seen in an MMA fight."
. By the end of the fight, Koscheck's eye was so swollen he was taken to the hospital where it was determined he had suffered a broken orbital bone but was able to continue to fight. Next up was Jake Shields at UFC 129 on April 30, 2011, in Toronto. Dana White himself said that if St-Pierre defeated Shields, it could initiate a move to middleweight and a superfight against the Middleweight Champ, Anderson Silva. By way of unanimous decision, St-Pierre defeated Shields and held tight to his Title. All eyes are on St-Pierre for the headliner fight against Carlos "The Natural Born Killer" Condit which is set for November 17. If Georges wins, the Silva fight possibly looms on the horizon which has caused much excitement. If he looses it will be a huge upset. 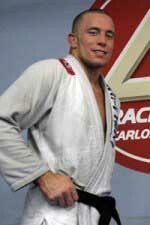 St-Pierre has trained at the Renzo Gracie Jiu-Jitsu Academy and received his brown belt from Renzo. He earned his black belt under Bruno Fernandes. He has also trained at Greg Jackson's Submission Fighting Gaidojutsu school along with Rashad Evans, Nathan Marquardt, and Donald Cerrone who also went with Georges to Montreal to help him get ready for his fight with Penn in UFG 94. GSP had earned the respect of not only his peers but of the media as well and also retains a swarm of fans, especially lady fans, and that combination of a following might very well be the mightiest feat an MMA fighter can accomplish. Georges St-Pierre will continue to defend his title with his winning style of Kyokushin, wrestling, Muay Thai and Brazilian Jiu-Jitsu and spirit that cannot be stifled. If victorious in UFC 154, he may be moved up in weight class and face off with Silva Anderson which, if he wins, would be a historical event. Georges is extrememly popular and you can find some good gear with his name on it.